Ideally we need a revival of Christianity, but you can't legislate for that. How about we replace all religion with the simple but true admission of "I don't know"? (I don't know if there is a God. I don't know what created the universe. I don't know if there is life after death). That is the only honest position. Anyone saying or claiming anything different is either intentionally lying or mentally ill. 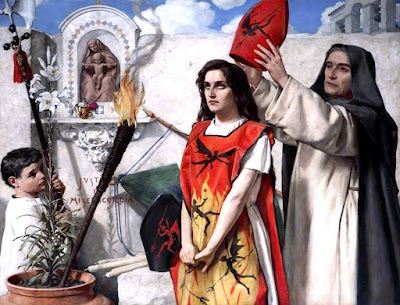 In some ways the accused were better off being charged by the Inquisition, which took great care to protect many people from false accusations. I'm not sure how the comments veered into the validity of Christianity when surely it was analogous of intolerance of views towards Rees-Mogg. We have great tolerance of currently violent religions but not a peep from liberalism. The real focus should be on a liberalism which has truly been hijacked by a cancer that is bred in the petri dishes of universities in western civilisation. A rancidity of safe spaces, of micro-aggression, revisionist moral judgement and an intolerance of words that is happily met with a McCarthyism and violence if someone feels ‘offended’. These citizens have grown up in safe, stable societies and ignorant of the world’s culture around them. They have grown up without having to pay in blood and misery the benefits that our recent ancestors provided us. Not only in wars but of women’s suffrage. They have grown up without conceptualizing the fragility of our own democracies and how insidious socialism and liberal fascism is. It has unfortunately emerged in tandem with the culture-less swathe of migrant invasion that provides nothing of benefit to Europe and the UK. Indeed, the Islamic barbarity and the African male migrants are an anathema to liberal democracy and the rule of law. There’s no enrichment to be had unless you call a wave of sexual violence against women and children such. We are witnessing a terminal degradation of European civilization that has been inflicted by our own naive liberal citizens and political leaders like Merkle. Forget terrorism, that’s a walk in the park, it’s the social issues of having a million non-consensual breeding males that will produce non-productive offspring in insular ghettos who will be condemned to being angry and without opportunity. No reasonable person would dispute that western civilization has a duty to house refugees. But we’re not addressing refugees but polluting a cultured society with an uncultured male dominated one aided and abetted by the dishonest liberal #Welcome Refugees” society. Of course, questioning, positing or criticizing this only leads our dear leftist & liberals calling the questioner a racist and committing fratricide. They are the real danger to western civilization as they don’t even believe a problem exists. Jim, you are so me but far more eloquent with words. Bravo. A very good summary of where liberal soft totalitarianism is leading us. However, to say 'nearly everyone will do almost anything to avoid being called any of these words' is a bit pessimistic as there are plenty of commentators and blogs on the internet willing to challenge the liberal hegemony.